The second MCIBD conference was held on June 10, 2017 at Lister Hall, University of Alberta. This conference focused on the interactions between chronic illness such as IBD and mental health. 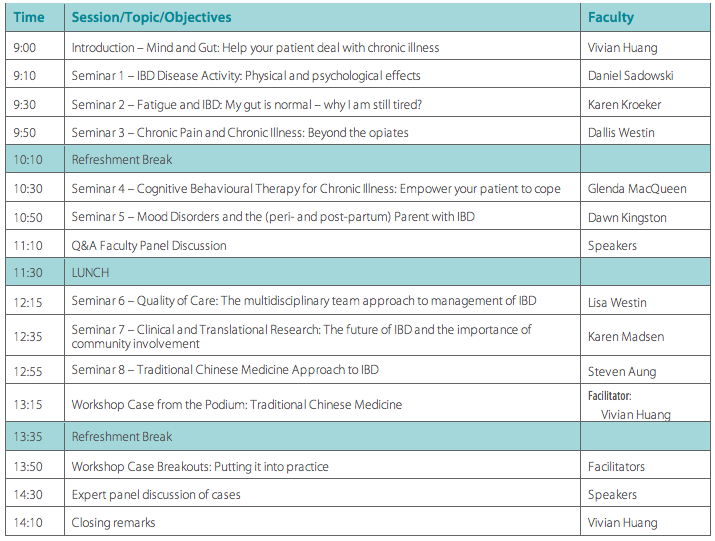 The conference included a series of interactive seminars, and workshops, led by expert clinicians in IBD management, psychiatry, psychology, nursing and alternative medicine. More than 40 physicians, nurses, and allied health professionals involved in the care of men and women with IBD attended the educational event. The event was sponsored by U of A FOMD, and several pharmaceutical companies (Abbvie, Janssen, Takeda, Merck, Ferring, Shire). You can download the Syllabus PDF here. Please view the agenda for program topics, objectives and format. You can download PDF’s of the presentation by clicking on the links below.